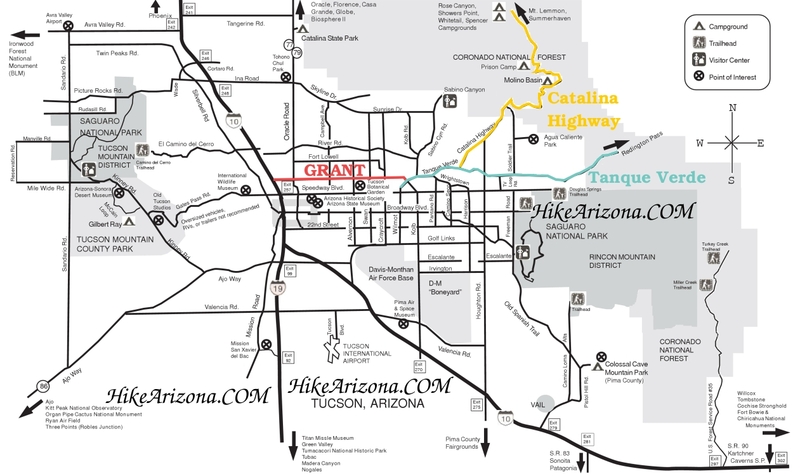 The Garwood Trail was named after Nelson Garwood (1879 – 1971) who in 1930 moved to Tucson and later bought 840 acres near Wild Horse Creek in 1945. It was to be the Bar G Ranch but he never had cattle on it. Garwood built his house and the dam around 1945. The house was just below the dam and just below what is now the Carrillo Trail near the junction with the Garwood Trail. The House no longer remains but the dam still stands. The foundation for his diesel generator remains along the Carrillo trail. The remnants of the road to his house also can be seen below the Carrillo Trail. There is way too much information about this to post here but I found lots of information on the internet including photos. If interested, more information can be had by searching under Nelson Garwood. 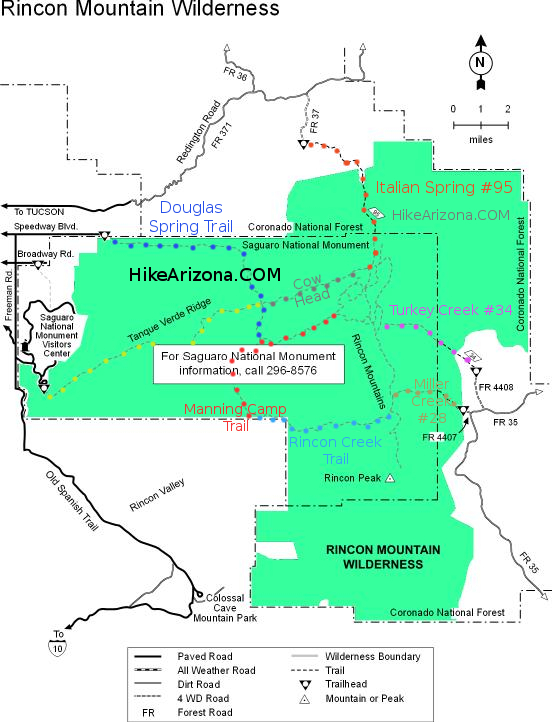 From the Speedway trail head, take the Douglas Spring Trail 0.2 miles and head south (right) on the Garwood trail. This trail is heavily traveled so getting off trail is difficult but probably not impossible. 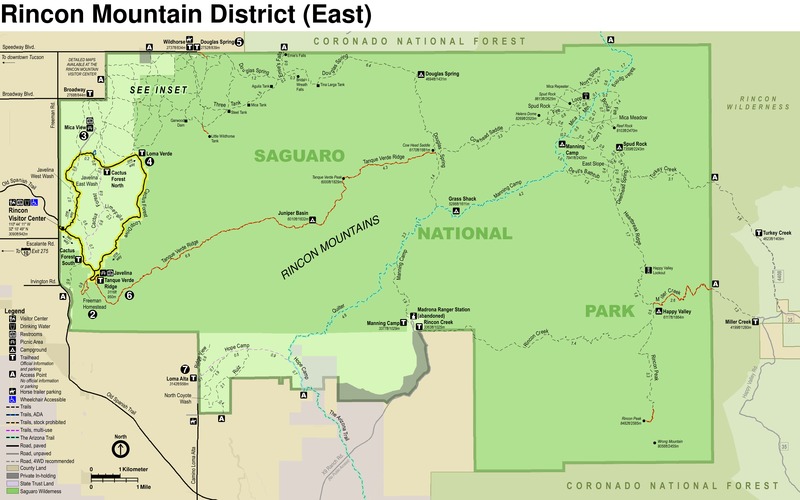 The trail follows along the desert floor just below the Rincon Mountains fore range hills and slowly approaches the hills as you get closer to the end of the trail at the Carrillo Trail. Just after you turn right on to the Garwood trail there will be a sign for the Stock Bypass trail that goes off to the right. The Converse trail heading east is encountered at 0.3 miles in. 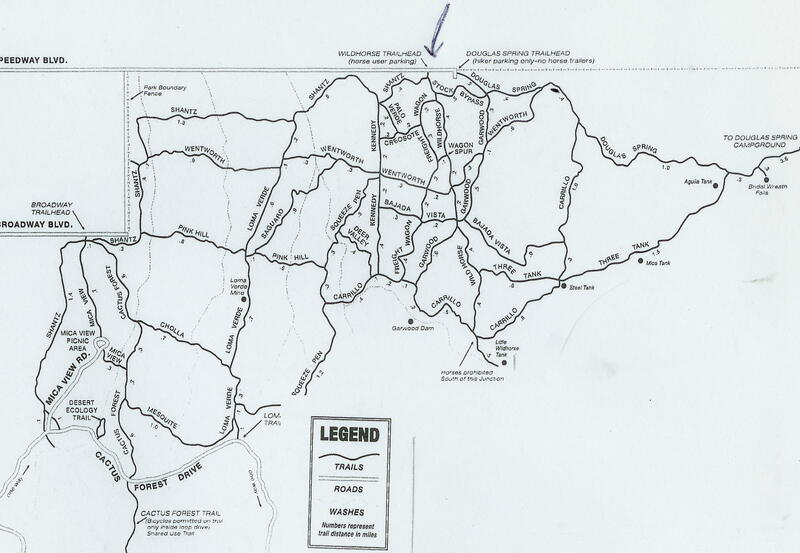 The Converse Trail use to be the Wentworth Trail that went from the Douglas spring trail (at 0.5 miles in) to near the Broadway trail head. This trail has been renamed the Converse Trail heading east and the Vanover Trail Heading West. The section of trail between Garwood and Squeeze Pen Trail has being abandon and no longer exists. At this point the trail has gained about 75 feet in elevation and will continue about this elevation until Bajada Vista Wash at 0.75 miles in. There is a trail sign at this wash indicating that there is a route along the Wash that can be taken all the way to the Wildhorse trail (.6 miles). After the Bajada Vista Wash the trail climbs the remaining 30 feet of elevation and comes to the junction of the Bajada Vista Trail west and the Wildhorse Trail and of course the Garwood trail that continues on through. The old abandon Bajada Vista trail east use to also cross here. Read the signs carefully (during high use times on this trail, I believe they need to install a traffic light here). The trail continues to the southwest slowly dropping about 50 feet until at 1.2 miles it crosses one of the creeks for Deer valley Wash and another creek for Deer Valley Wash at 1.4 miles. The next 0.1 mile climbs back up 40 feet to the Carrillo Trail. This is in Saguaro National Park so the usual plants and cactus can be seen and since this is a leisurely hike can be enjoyed as you hike. Still have to watch for the usual critters along the trail though. 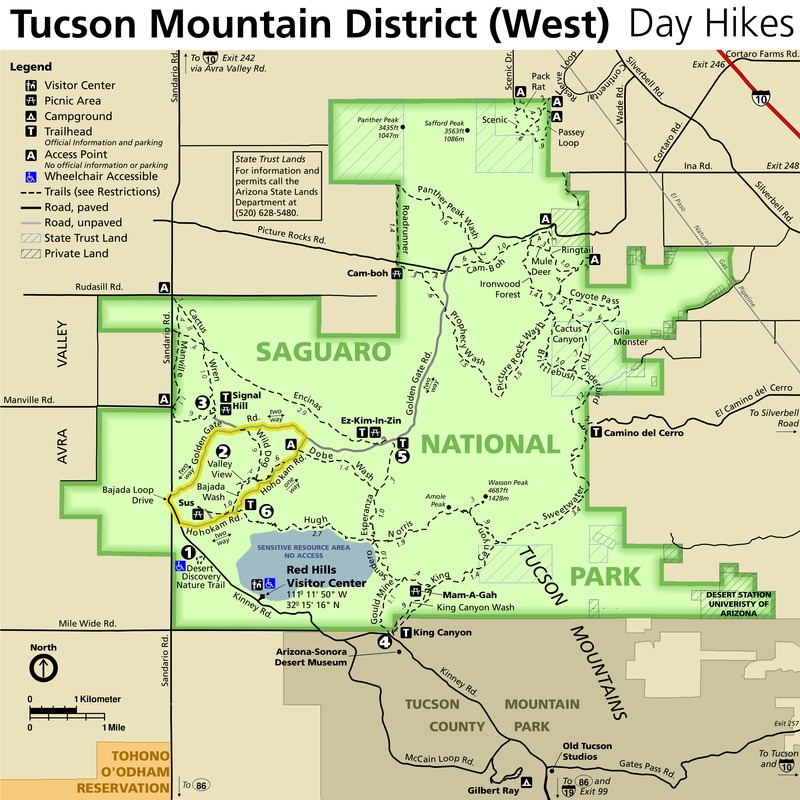 This is another one of the trails that lends itself to loop trails, short loops (Garwood – Wildhorse) and longer loops (Garwood, Carrillo, Squeeze Pen and Shantz) that encircle the whole Northwest Saguaro National Park trails.